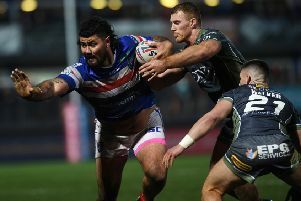 IN-FORM Wakefield Trinity Wildcats half-back Jacob Miller has credited his recent performances to coach Brian Smith. Miller, who scored four tries in the 40-20 home loss to Warrington Wolves two days ago, had a slow start to his Wildcats career, after moving from Hull in the off-season. But the Aussie admitted he feels he is now thriving under Smith’s coaching – and he reckons the experienced boss has had a positive effect on the entire team. “I am really enjoying [working with] Brian since he has taken over,” Miller said. “He has stiffened the place up and we are slowly improving. Miller added: “I think his style of coaching suits me and suits everyone in the team. Miller played his first two games under Smith at full-back, before being switched to scrum-half. He scored a brace of tries in the defeat at Catalans Dragons in Smith’s second game and crossed once at home to Hull before his four touchdowns last weekend. Miller said: “I got a bit lucky – I was in the right place at the right time. I would have swapped all those [Sunday’s] tries for a win, but I am pretty happy with the way I am going. The main thing is we are slowly improving. Warrington are a top-four side and are going to be there right to the end. Captain Danny Kirmond is on Wildcats’ long-term injury list, but players including Tim Smith, Pita Godinet, Ali Lauitiiti and Ian Kirke did not feature against Warrington and could play in the Qualifiers. “That’s one thing he [Smith] has done, he has brought in a few people so everyone’s fighting for their position and no one’s safe,” Miller observed.